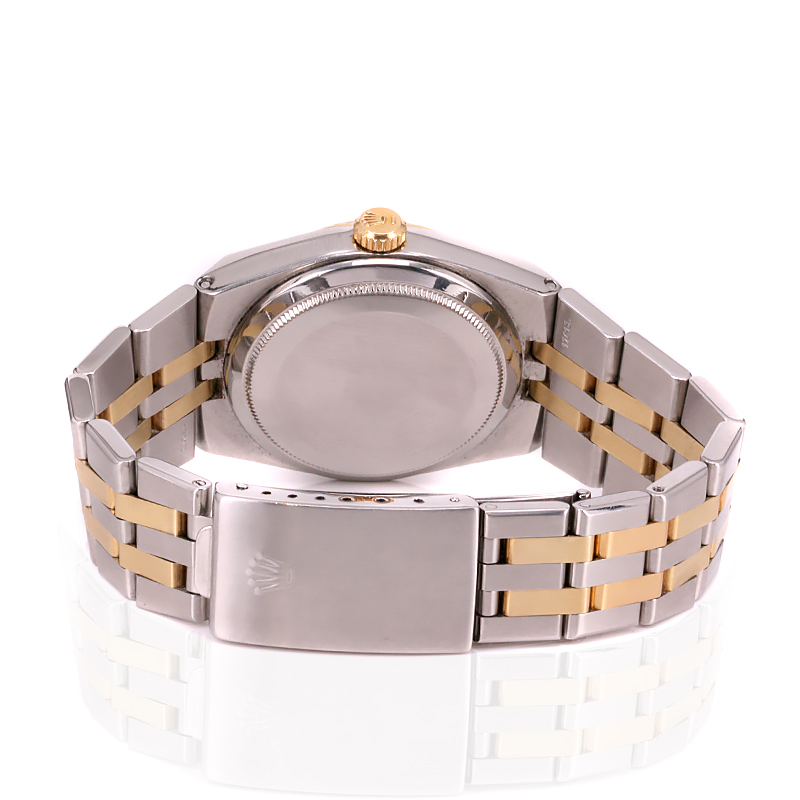 Product code: W1399 Categories: Rolex Watches, Watches. 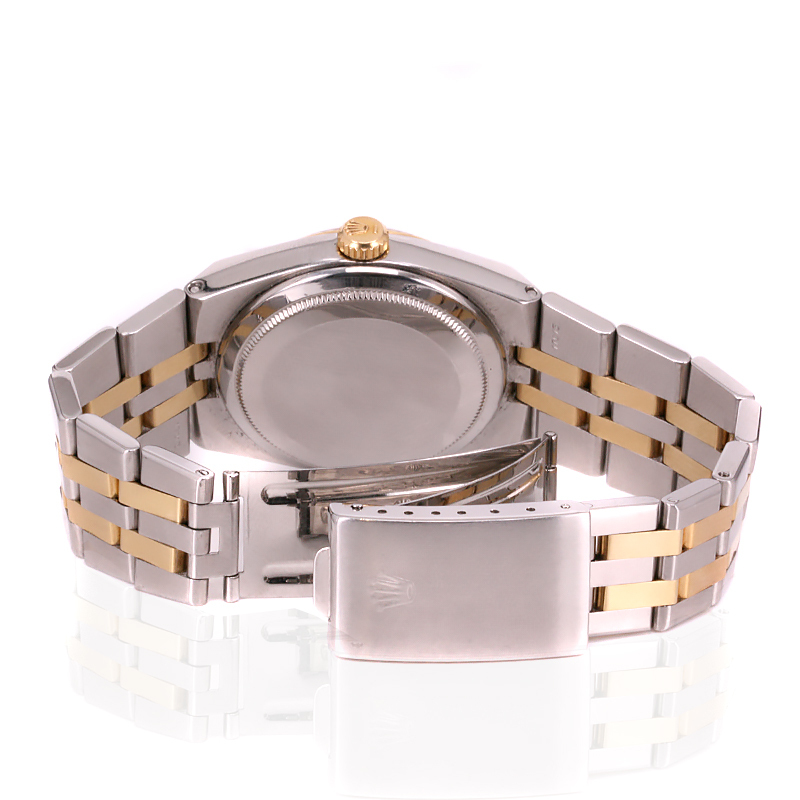 In recent years, the Rolex Oysterquartz has attained somewhat of a cult status as for so many years it was not highly sought after as it has a quartz movement, however now these Rolex Oysterquartz watches are becoming collectable, and here is a vintage 18ct gold and steel Rolex Oysterquartz watch reference 17013 dating from 1982. With less than 25,000 Rolex Oysterquartz watches ever produced, and this includes their entire range on stainless steel, gold and steel as well as solid gold Day-Date models, not only are there not as many around, but they also have such a distinct and iconic look to them, thanks in part to the unique band which somewhat resembles the Rolex Oyster band, but not only is different in the link thickness, but also integrates into the watch case itself. Measuring 36mm across plus the Rolex screw down crown, it has the elegant and traditional champagne coloured dial with sleek index markers and the date window. The 18 carat yellow gold and stainless steel band feels amazing on the wrist, and the band is in exceptional condition with no flex or wear showing at all. Inside is the highly accurate 11 jewelled quartz Rolex calibre 5035 that not only runs flawlessly, but also comes with our twelve month warranty. In brilliant condition inside and out, this vintage Rolex Oysterquartz will certainly be a conversation starter. The Rolex Oysterquartz was produced not only for a mere twenty-five years, but less than 25,000 were ever made which in the watch industry is a relatively low number. First produced in 1972, it came in a few variants with the datejust models in either all stainless steel version (reference 17000), stainless steel and yellow gold (reference 17013), or stainless steel and white gold (reference 17014). Then they produced the President version with the day and date function, in solid 18 carat gold (reference 19018) or in 18 carat white gold (reference 19019). Rolex also made an unusual model, the reference 19028 Day Date Oysterquartz that has a pyramid design detail on the hour markers, bezel as well as the bracelet. The Oysterquartz Datejust has the Rolex calibre 5035, and the Day-Date version the Rolex calibre 5055.